Umrah can be performed at any time every month. There is no time restriction in this regard as Umrah may be performed at any time during the year. As far as Umrah visa requirements are concerned, there is no restriction in this regard. The applicant needs to fill out and submit the application form for Umrah visa. The statement written at the end of the application form must be carefully read and signed. You can also get the visa application form at your house by mail. In order to do so, you need to provide an envelope containing your address to the Saudi consulate situated nearest to your place. It is important to note here that if a person has a non-Islamic name, then he or she has to submit the certificate from an Islamic center or a mosque that the applicant is Muslim. Otherwise, the person will not be considered eligible for the Umrah visa. Applicant must attach one passport size photograph having a white background to the application form. It is important to note here the photograph must contain a clear image of the face of the applicant in which the applicant must be facing the camera and side or angled views are not accepted. At the time of submission of application form for Umrah visa, the passport of the applicant must be valid for at least 6 months. A confirmed flight ticket must also be provided and the submitted ticket should nonrefundable. The issued visa is for 2 weeks only and after the entry to Saudi Arabia, the applicant must leave the country within 2 weeks. There are a few special Umrah Visa Requirements for women and children. Any women or children coming to Umrah must be accompanied by father, husband or any male relative but the person accompanying the woman must be mahram. Proof of relationship must be provided in such a situation such as the marriage card of the wife, the birth certificate of a child indicating the names of his or her mother and father. Ladies and children must be accompanied by a mahram in the same flight in which the lady or children is traveling. If the age of a lady is 45 years or more, she can travel without a mahram in case she is traveling with a family or any organized group but in order to travel alone, she needs to provide a certificate of No Objection from her mahram. 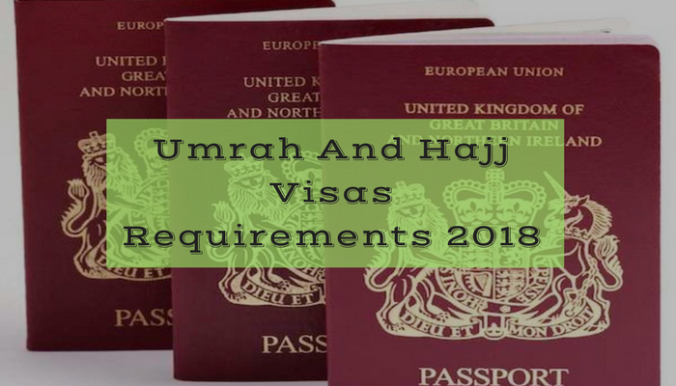 If the applicant is applying for Umrah visa from the country in which he or she is not living as a citizen, the person must provide a proof of his or her right to live and stay in the country from where the person is applying for Umrah visa. If Umrah visa is issued for the month of Ramadan, the applicant must leave Saudi Arabia before Eid. The person needs to ensure that he or she must leave the country during Ramadan and should not try to celebrate Eid in Saudi Arabia at any cost. Although the visas for Umrah and Hajj are provided free of cost, however, there may be charges for a few services that the applicants receive during his or her stay at Saudi Arabia.